pie | What's Cooking at the Genua's? Anyway, I can’t take credit for this recipe. It’s Rachael Ray’s recipe. If you’ve ever watched her talk show then you know she CAN’T BAKE! So she says. She always burns the bread in the oven! Nice to know she’s just like the rest of us. Well this recipe does not involve baking so even Rachael Ray can make it! And if you really don’t feel like making the crust yourself, skip that part and just buy one of those Keebler graham cracker pie crusts. Who is gonna know! 1. In a glass measuring cup, sprinkle the gelatin into ½ cup cold water and let sit. 2. Meanwhile, in a bowl, combine the graham cracker crumbs and sugar. Mix in the butter. Transfer the mixture to a 10″ deep-dish pan and press into the bottom and up the sides to form a crust. Freeze until firm. 3. Microwave the softened gelatin until melted, 30 seconds. 4. Using an electric mixer, whip the cream until stiff peaks form. Transfer to a medium bowl and refrigerate. Add the cream cheese to the mixer bowl and beat at high-speed until fluffy, about 2 minutes. 5. Add the condensed milk, cream of coconut and melted gelatin and beat at medium speed until smooth. Fold in the whipped cream. Transfer the pie filling to the chilled crust. Refrigerate, uncovered, for 3 hours. 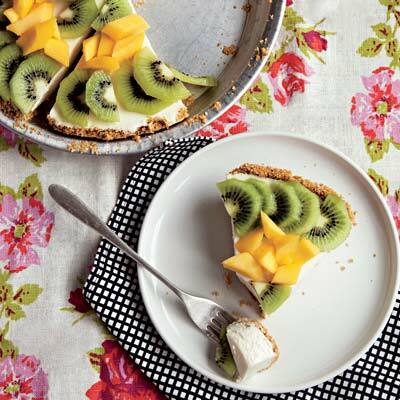 Top with the mango and kiwis.